I really struggle when it comes to choosing things to make for dessert. I’m a savoury person and I just don’t find it as interesting as putting together a delicious main course or a tasty starter. This weekend I was put in charge of doing the pud for my Mum’s birthday meal and I was stumped for ideas. I have a few cakes in my repertoire but they’re too big and heavy… I considered hot chocolate brownies with ice cream for a minute before I realised that isn’t really my Mum’s sort of thing. I began to think about what she might like to eat. My Mum’s a real healthy eater and loves a fruit salad but that’s far too easy and not special enough, so I racked my brains for something a little more indulgent and then it hit me…. white chocolate: Mum’s real big weakness. 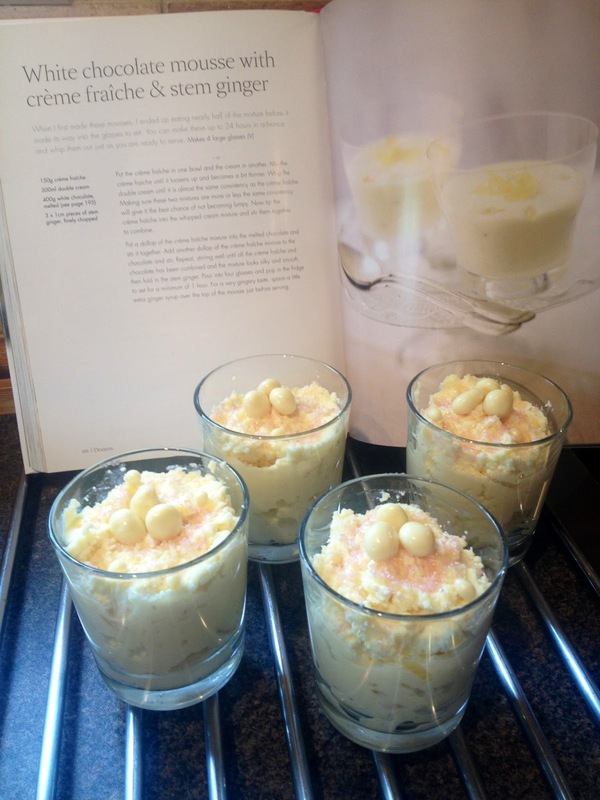 I began scouring my recipe books and came across this gem in Lorraine Pascale’s Home Cooking Made Easy. This recipe was so easy, it only has 4 ingredients and took no time at all, but best of all, in spite of this it looks really impressive. The mousse turned out beautifully creamy with a bit of a kick from the ginger and it feels like a really decadent dessert. I think I did over whip my cream slightly so the mixture turned out quite heavy, almost like a cheesecake topping. I’ll go a bit easier on the whisking next time. 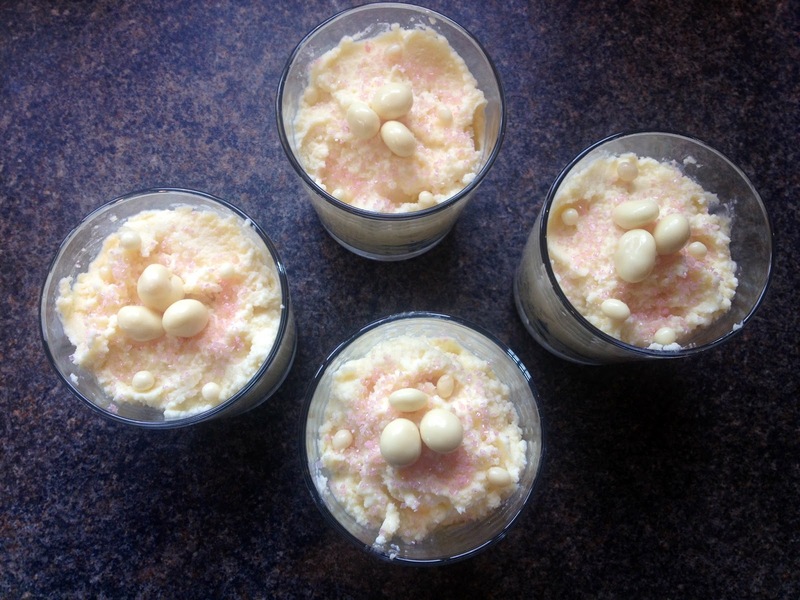 I served the mousse in little glass tumblers, raided the baking cupboard for a few bits to help decorate (pink sugar never fails me) and voila! An easy impressive pud that’s definitely going to become a regular on my table.